Source: Wikipedia, "Battle Shark", available under the CC-BY-SA License. 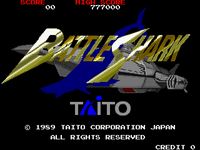 Battle Shark (バトルシャーク) is a first person shoot 'em up arcade game released in 1989 by Taito. The player looks through a submarine periscope in order to destroy enemies, featuring simulated damage whenever the player gets hit by either an enemy torpedo or a missile. The player starts off with a limited amount of torpedoes, which slowly replenishes itself, so players must shoot accurately. Power-up targets appear throughout the games, which can increase the player's supply of torpedoes, repairs damage or add extra firepower in addition to the torpedoes. At the end of each stage, the player faces off against a Boss character. The game was released for Taito Legends in 2005.